I first met Tsewang Norbu-la at the Frankfurt Book Fair (the world’s largest trade fair for books) in the year 1999 (I think it was) where Tibet Forum had rented a stand to publicize recent publications on Tibet which included Tsering Shakya’s Dragon in the Land of Snows, and my own Mandala of Sherlock Holmes. Among the friends and supporters gathered at the Tibet Forum stand was this most extraordinary looking Tibetan. He had long shaggy hair that appeared to sprout out of an enormous full beard – and there was no telling where the one ended and the other started. I may have inadvertently looked a little too hard at him when I shook his hand for he asked jokingly “Did you think I was Asahara?” (the Japanese doomsday cult leader). But the profusion of Tsewang-la’s facial hair could not conceal the intelligent twinkle in his eyes and the warmth of his smile. We immediately became good friends. 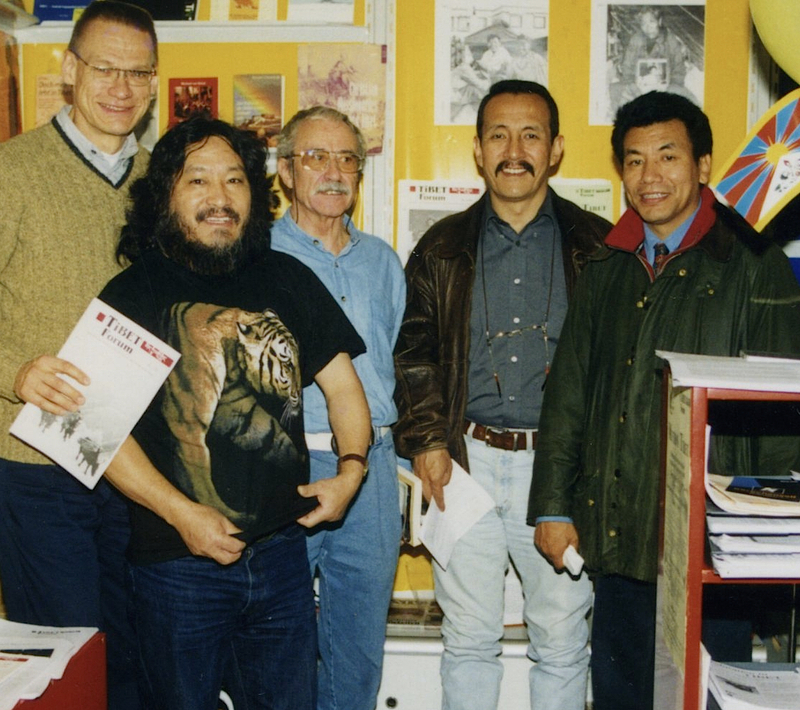 Jan Anderson, Tsewang Norbu, Helmut Clemens, Jamyang Norbu and Tsering Shakya. 2001, Frankfurt. Another striking element in Tsewang Norbu’s makeup that I absolutely have to mention, was the T-shirt he was wearing, which had a very large image of a prowling tiger in the front. Tigers were his thing, I later discovered. He seemed to have owned a whole wardrobe of assorted Tiger T-shirts. I think I can honestly say that I never saw him wearing anything as boring as a dress shirt or a suit. I have been told on good authority that even when giving testimony or making a presentation before the German Federal Parliament he would wear one of his trademark Tiger T-shirt. 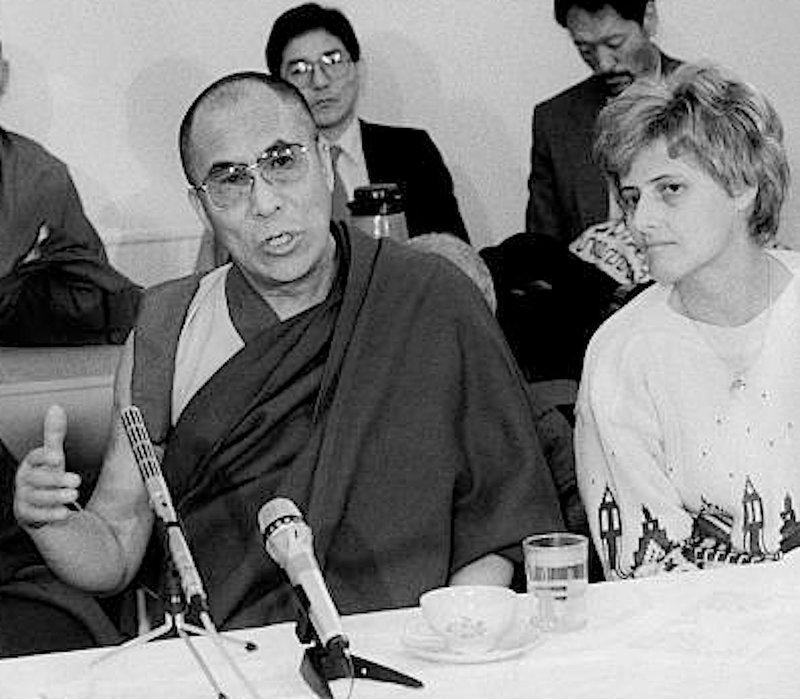 German officials and members of the Bundestag, who were all aware of his long-standing role in the Tibetan freedom movement in Germany and his extensive knowledge of the issues, never batted an eyelid at his appearance or showed him any disrespect. The magnificence of his eccentricity simply captivated everyone. Might Tsewang-la’s Tiger fixation have something to do with his origins? He was born in 1 July 1949 (Earth-Ox year) in the area of Sengge-Ri (Sengge on maps) in Lhodrak, Southern Tibet, very near the border of Bhutan, which (at least in the past) was a land of thick forests and abundant wildlife where leopards and even tigers roamed – all the way east to Kongpo Nyingtri and Zayul. Following the March Uprising of 1959, and the major advance of Chinese Communist troops in the Lhodrak district (in pursuit of the retreating Four River Six Ranges resistance fighters), Tsewang Norbu’s family crossed over the border into Bhutan and then moved to India. Tsewang-la gained admission in the new Central School for Tibetans at Mussoorie, where he turned out to be a diligent and outstanding student. 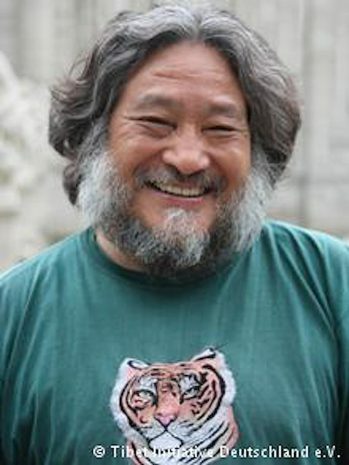 Perhaps because of his background as someone from Southern Tibet someone gave him the nickname “Tak-go” or “Tiger-head”. A school-friend of his told me that that his nickname was “Tang-go or” horse head”. Be that as it may, what should be noted is that, in 1969, he was in the very first batch of exile Tibetan students to graduate high school, a very proud and seminal moment for the Dalai Lama and the exile government’s noble initiative to provide a modern education to all young exile Tibetans. I recall an idealistic phrase used by officialdom then to describe these graduates “mahong bhod ki sontsa” or “the seeds of a future Tibet”. The phrase was subsequently employed to exhort succeeding generations of students to study diligently for a free and independent Tibet. Tsewang Norbu finished his high-school in April of 1969 and then joined St. Stephen’s, the premier college in Delhi University, where he completed his B.A. with honors. Subsequently Tsewang la struck up a friendship with an altruistic German dentist who was travelling around Dharamshala and Mussoorie in the 70s, fixing the teeth of Tibetan children and other refugees. Tsewang-la helped this dentist, translating for him besides assisting him in other ways. This dentist subsequently helped Tsewang Norbu travel to Germany in 1973 to pursue his further studies there. Like young Tibetan exiles everwhere, Tsewang Norbu and the handful of Tibetans in Germany would often meet to discuss what they could do to promote the Tibetan issue. But those were bleak years for the Tibetan cause in the West, with intellectuals and politicians in Europe infatuated with Mao and the Cultural Revolution. But following the death of Mao, the partial opening up of China and Tibet, and in particular with the outbreak of the pro-independence uprisings in Tibet from 1987 through 1989, there was a dramatic and welcome shift in the West’s understanding of the Tibetan tragedy and its support for the Freedom Struggle. Fortunately, during this crucial period Tsewang Norbu had managed to get a job at the Bundestag (Federal Parliament), specifically in the office of the late Petra Kelly, founder and the leader of the German Green Party, and an indomitable Tibet supporter. 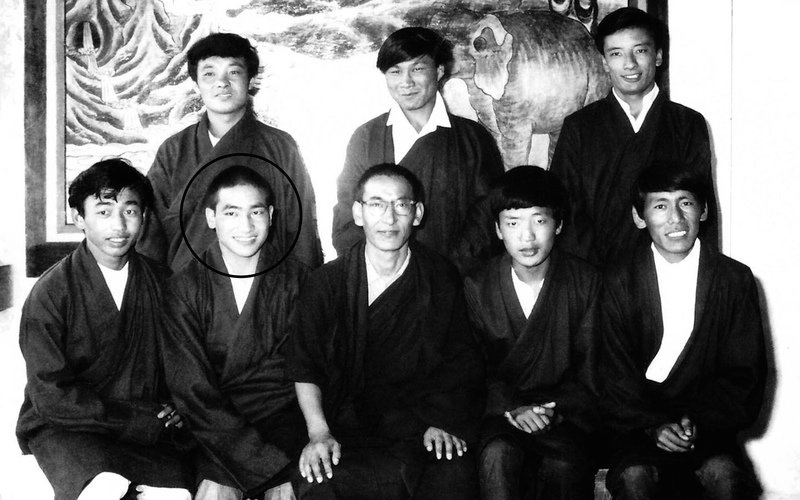 Tsewang la working with Tibetan volunteers in Germany as Tawu Lobsang Palden (also some young exiles from Switzerland), and with the support of the Green Party managed to organize the first International Tibet Hearings. I am not that well grounded about events in Europe during this period, so I request better informed readers to post their memories or anecdotes in the comment section. With the undermining of the Tibetan struggle from the end of the last millenium, Tsewang Norbu, like many committed Rangzen warriors, now looked around for other ways to keep the Tibetan issue alive. He kept up his work with the Tibet Initiative, organizing protests and actions in Germany, but he also began looking for ways to extend his service to the broader exile community and even to Tibetans inside occupied Tibet. 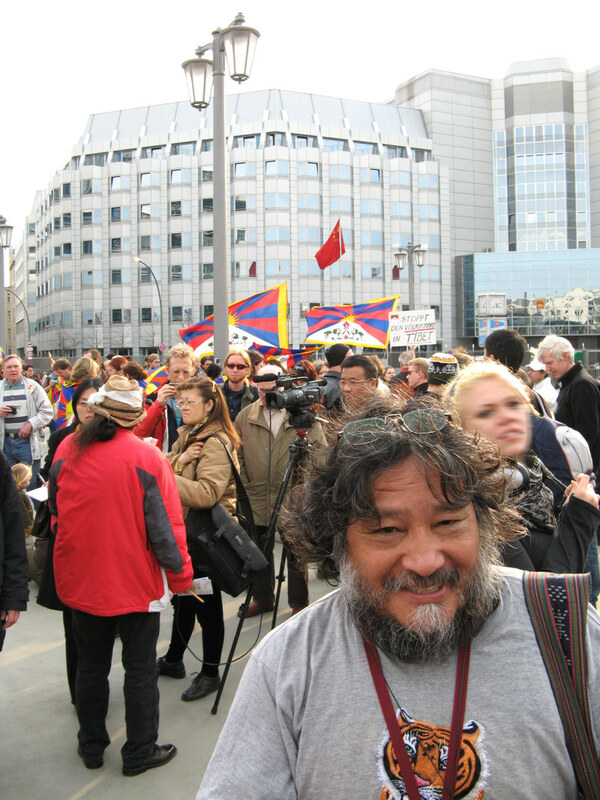 Since the Tibet Uprising of 2008 Tsewang Norbu also began to write articles and opinion pieces in English which appeared in Rangzen.net and also on my blog site. He was tireless and outspoken in arguing the case for Tibetan independence, and in one of his more substantial pieces he undertook a complete and definitive translation of the “13th Dalai Lama’s Declaration of Independence”. When the Tibetan exile government convened the now infamous “Special November Meeting” at the end of 2008 Tsewang-la wrote this compelling essay “Put Rangzen Back on the Agenda – An appeal to the Delegates of the Special November Meeting” which in the prevailing sellout climate in Dharamshala then, fell, invariably, on deaf ears. He was in Washington DC and New York City this January. I don’t know why, but somehow I never got around to meeting him. I could kick myself for not having made more of an effort to book that air-ticket. Now Tsewang-la has been taken away by a tragic accident and Tibet has one less Rangzen warrior to fight for its liberation. I have one less friend and comrade. Tsewang Norbu-la is survived by his wife Ingrid, four sisters, nieces and nephews. 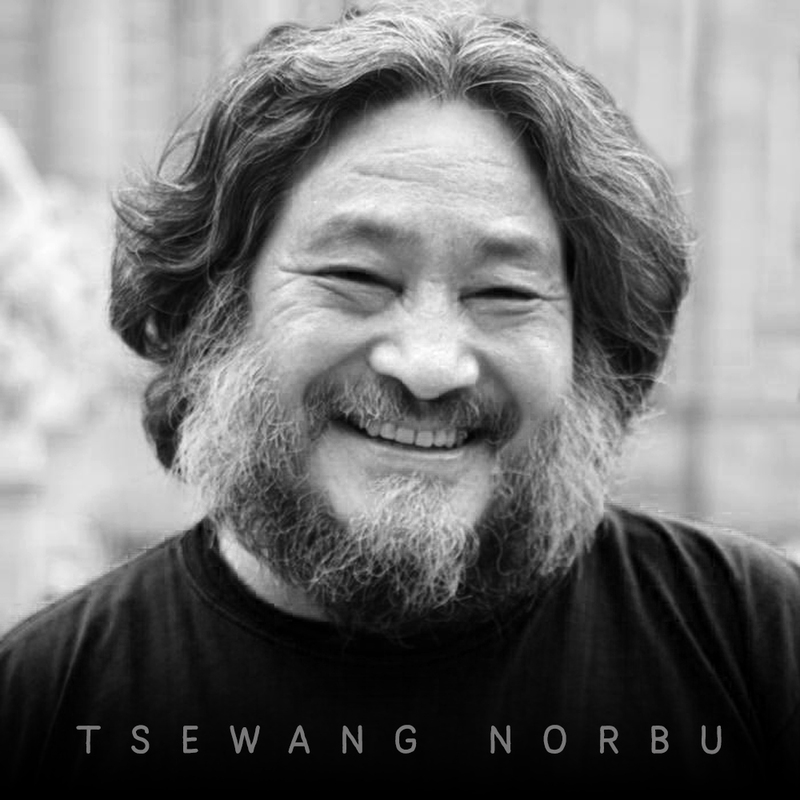 Thank you so much Jamyang Norbu la for writing this beautiful piece a heart warming eulogy on late Tsewang Norbu la and the services he had rendered for Tibetan cause . It was sad to find out about a school mate in this way but; equally a proud moment to learn good things about someone with whom one shared the same school ground for a year and half or so where likes him walked on as well . Do not claim to know him from close but know enough to remember his nickname Ta-goe for his cleverness in his studies as horses are believed to be smart and full of life . Because the students called him by that nickname and not kindly at that ; Gan Renpoche at the time compelled the students of the school almost to address him as , Awa Ta-Go and ; had them call him with that name with respect . So his name Awa Ta-Go is/was blessed name by his Teacher . for his intelligence and his great nature . I do not ever recall him retaliating against calling him by that name . May he RIP. OM MA NI PAD MAY HUNG 🙏🏽🙏🏽🙏🏽🙏🏽🙏🏽🙏🏽!!! First of all I must thank Jamyang Norbu la for perfectly translating the much abused Tibetan phrase and validating and supporting my relentless campaign against distortion of the meaning of the Tibetan phrase མ་འོངས་བོད་ཀྱི་སོན་རྩ། as “Future Seed of Tibet”, when translated into English by 99 % Tibetans whenever they write or talk about it public forums. I regard this misconception due to an inherent weakness in thinking and contemplating. For the last several years, I have been repeatedly drawing attention to this thoughtless and erroneous translation trap to which everyone from commoners to leaders and high ranking officials – fall into. At times, I had to write in detail why and how it is wrong to translate it as “Future Seed of Tibet”. Most wrongly think ‘future’ qualifies the ‘seed’, whereas it is not. ‘Future’ is the qualifier of ‘Tibet’. The children are the ‘seed’ of ‘future’ of Tibet. Whether Tibet’s future will be bright or gloom depends on the kind of education and up-bring, nurturing and grooming our children to receive now from our society. This mis-representation still continues as only recently I noticed a prominent Tibetan distorting the original Tibetan phrase itself and talking referring to our youth as “མ་འོངས་པའི་སོན་རྩ” which is completely different from “མ་འོངས་བོད་ཀྱི་སོན་རྩ་”. This is the height of absurdity, as “མ་འོངས་པའི་སོན་རྩ” can only mean “ Future Seed of Tibet”, as if they the youth will qualify as the ‘seed’, sometime in the distant future, when they will reach at 40 or 50 years of age in their life. Sheer nonsense utterance! Coming to the main point, the sad sudden news of passing away of Tsewang Norbu la, and subsequent highly emotionally charged tributary notes and comments that flooded social media and suddenly depicting him as an outstanding intellectual, activist and a person, overnight, indicates that there is a communication gap and something is really amiss in our society. It was like only after his death did we talk and write about these in great details. For example, the fact that he was a St. Stephenian puts him in that highly respected privileged few intellectuals of which late Prof. Dawa Norbu tops the list. The two others are: Highly respected senior CTA official, Ku-Ngo Thupten Samphel la and Kuger Yigtsang, Private Secretary (English) Tenzin Taklha la. Lots of positive developments have taken place in recent times and Tibetan media houses, governmental and private have made much advancement in terms of their expanse and delivery system so is people’s interest in national affairs and participation – all this have made significant improvement in disseminating news and information in the community and international level as well. It is hoped that in future there will be better awareness and appreciation of the work and services of our outstanding Tibetan personalities and intellectuals do for the nation while they are alive, wherever they live and work in whatever position and capacity. Deeply mourning the loss of yet another true son of Tibet. Thank you so very much Jamyang Norbu la for this befitting tribute richly deserved by the departed soul. With infinite grace and blessing of Tri-Ratna, may he quickly return to a Tibetan family to continue his service to the nation and people of Tibet! I was so sorry to read this post. It had been in my mind to call Tsewang sometime during the next few days. This is a great loss. Tsewang was one of those rare creatures who was as generous, kind-hearted, patient, optimistic, enthusiastic, intelligent and selfless a person as one could hope to meet – with, as JN says, a streak of eccentricity that was as unexpected as it was endearing. The last time we spoke, a few months ago, he was about to leave for Africa. It was, he told me, his ambition (and intention!) to drink the milk of a lioness. I hope that if he did not achieve that in this life, he might do so in some future state. Tragic accident? How did this great man die?